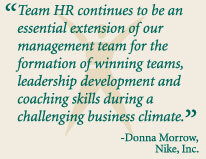 First, I’d like to say thank you for your interest in TeamHR. We are a group of accomplished and talented professionals who together have helped some of the best organizations become even more successful. How do we do it? By asking the right questions. By understanding your unique culture and needs. By gathering crucial information and synthesizing our findings with a combination of experience, intuition, and knowledge of proven strategies for success. And what happens when we get involved is extraordinary. Our clients gain innovative, fresh solutions that are exactly right for them. We believe that is why 95% of our business comes from referrals. We are a diverse team that brings a broad range of talent and expertise. We’re committed to delivering custom services beyond what is expected. And we do it all with respect, clear communication, solid strategy, partnership, sensitivity, and humor. I’m proud to be part of such a remarkable team. We’ve inspired trust, confidence, and positive change in our clients’ businesses. And that’s a big reason why we love what we do: Our reward is seeing you succeed.